Growth in the online shopping sector has grown exponentially as people have embraced shopping online. There has never been a better time to launch an ecommerce site! Beyond that — to reduce administration efforts — your site can be integrated with additional software such as ERP, POS, order fulfillment systems, payment gateways, and shipping services, as well as with e-commerce marketplaces like Amazon and Ebay. With more than 5 years of experience and 500 implemented projects, we are perfectly qualified to deliver a powerful and efficient web solution, fully integrated into your ecommerce process chain. 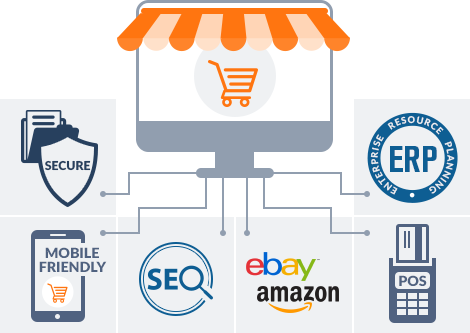 B2C WEBSITES FOR RETAIL BUSINESSES Targeted online stores, powerful and scalable, optimized for mobile devices and search engines, easy to use for both your customers and store administrators. B2B WEBSITES FOR WHOLESALE TRADERS Effective B2B solutions tailored to your business-to-business market, with rapid order process for better customer experience, multiple customer groups and seamless integration with diverse systems and applications. MULTI VENDOR ONLINE MARKETPLACES Online stores where multiple vendors sign up and sell their goods, manage their listings and orders; with various payment and shipping options and custom workflows if required. CUSTOM DEVELOPED ECOMMERCE SOLUTIONS Unique shopping cart solutions, custom built in accordance with non-standard requirements (custom product types, CRM or ERP functionality etc.) or with specific software architecture.